Ahead of the Han Solo-focused Star Wars movie, Solo: A Star Wars Story, that arrives in theaters May 25, 2018, Denny's is releasing a new Star Wars-themed menu and promotion to mark the occasion. The diner chain has partnered with Lucasfilm and non-profit No Kid Hungry for the campaign. 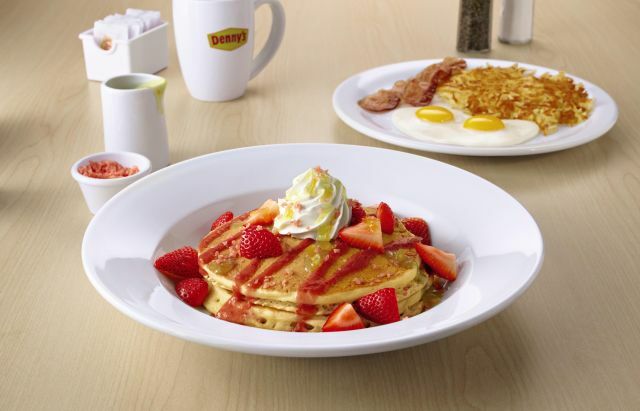 - Co-Reactor Pancakes - Two buttermilk pancakes topped with fresh strawberries, strawberry sauce, and whipped cream. The main feature is a side of Crystal Crunch Rocks (popping candy) and a warm citrus sauce to sprinkle/pour over the pancakes. The "reactor" is when the sauces hits the candy and they start popping. - The Blaster Fire Burger - A spicy burger featuring chipotle Gouda cheese and Ghost Pepper sauce joined by a hand-pressed grilled beef patty, bacon, lettuce, tomato, red onion, and pickles on a brioche bun. 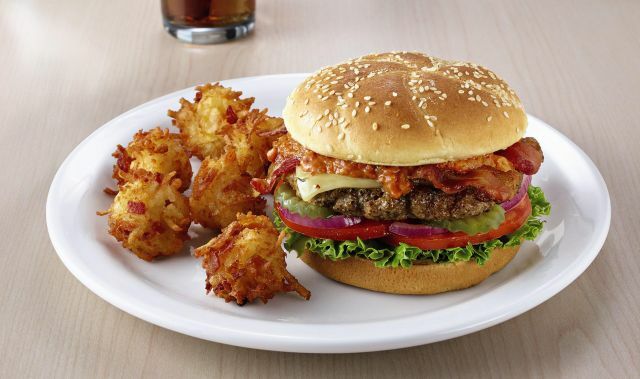 Wavy-cut fries are included on the side (and can be upgraded to Bacon Cheddar Tots for an added charge). - Lightspeed Slam - More of a play on words than anything, this is their Fit Slam with a new name for the promotion. It includes egg whites scrambled with fresh spinach and grape tomatoes, plus two strips of turkey bacon, a toasted English muffin, and seasonal fruit. - Two Moons Skillet - Two eggs over a skillet of diced ham, fresh spinach, sauteed mushrooms, and hash browns topped with Gouda cheese sauce, and shredded cheddar cheese. There's also an option to add a side of Crystal Crunch Rocks to any milkshake for an extra 99 cents. On the collectible side of things, Denny's is offering exclusive Solo: A Star Wars Story trading card packs for $3 in restaurants and via Denny's on Demand (their online ordering system). 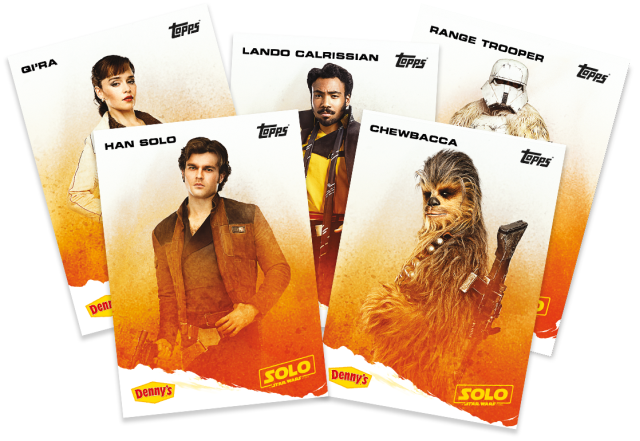 Each pack includes two of 12 different character cards, including Han Solo, Chewbacca, Qi'ra, Lando Calrissian, and more, plus a Denny's coupon for future use. A portion of the proceeds from the sale of the card packs (the chain has guaranteed at least a 1 million donation) to No Kid Hungry, which provides meals to children in need. Finally, you can also pick up limited edition Solo: A Star Wars Story collector cups featuring either a graphic of Han Solo, Lando Calrissian, Chewbacca, or Qi'ra plus a Millennium Falcon lid. The cups are available for $3.99 each which includes a soft drink, tea, or lemonade. Denny's Solo: A Star Wars Story menu (and collectibles) is available through June 26, 2018.